Students have teamed up with Grinnell’s Center for Religion, Spirituality, and Social Justice to launch a college textbook lending library. Over the course of the semester, Burnett met with Shorb to work out the logistics of getting a lending library off the ground. They had to complete three major tasks before the beginning of the next school year. First, they had to approach the Office of Financial Aid and ask them to compile a list of low-income students who would be invited to use the library. Second, they had to get the textbooks. Finally, they had to shelve and catalog the books. Shorb took responsibility for speaking with Brad Lindberg, director of financial aid, who agreed to help them out. He told her that if she and Burnett prepared information about the lending library, his office could determine the students in highest need of the service and contact them directly. That way, only the students themselves and the financial aid office knew whether any given student was on the confidential list. Once the library was up and running, Shorb and Burnett realized they were going to need some extra help. They decided to expand their team of two to a team of three. Ally Leicht ’19, another QuestBridge student, joined the library as student co-supervisor in the fall of 2016 and began assisting with the tasks of organizing, cataloging, and distributing the books. 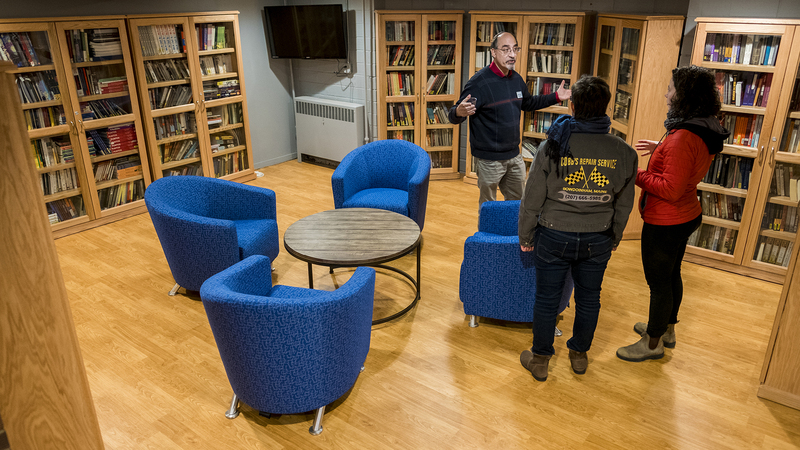 In the mid-2000s, a group of students called Grinnellians for Economic and Social Diversity organized and ran an informal textbook lending library for a few years from a residence hall basement. Although the intent was to support low-income students, it ended up being open to all.